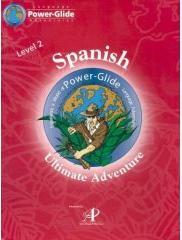 Power Glide home school foreign language programs are computer based programs that offer activity books and CD’s as well as online courses and games to teach students a foreign language. The Power Glide Foreign Language Courses were designed over 30 years ago by Dr. Robert Blair, when he observed that young people who had studied foreign languages for years, but lacked the ability to actually communicate well. Many people approach foreign languages as though vocabulary and grammar are the most important features to learning a new language. With many language programs you are given a list of words or phrases that are repeated over again and again until the student remembers it. The best time to start a language program is when you are young. Dr. Blair has spent time studying and experimenting with several different teaching methods in order to develop an easier way to learn a new language. He has now developed a method that he calls, “a natural language acquisition” which reflects the way a young child learns his own language. Power Glide is set up with stories, activities, and games that help in learning a new language by gradually soaking it in more naturally. Therefore homeschool students are learning the language without really noticing it. Their exercises help them to discover the language by seeing it, and listening to it, and by working in the language itself. The great part is that they have a lot of fun learning. The Junior Adventure Course is a home school foreign language curriculum for young children that puts your child in a story. They become the main character. The level of the story is influenced by the child’s fluency in the new language. Your child will hear the language being spoken and the associate the phrase using songs or pictures. Power Glide also includes a Parents Guide to help you understand what to do and explain it in more detail. It has tips about cultural information, lesson plans and other suggestions that will help you and your child get more enjoyment and have a better learning experience. This foreign language program also uses a unique technique called “Diglot Weave” which takes stories from your own language and transforms these stories into the language that you are studying. For example: As you are reading along in your own language and you have a picture of a house that you have to replace with the foreign language equivalent. Then there is a picture of a dog and you have to replace the word for dog. Then eventually you will be looking at nothing but pictures and translating them into the words of the language you are studying. This makes learning almost effortless. What most people like about this home school foreign language program is that it is set up to be fun. It is fun for the child and fun for the parents. Since it concentrates on comprehension through stories, games and interaction…students learn and apply the new language instead of just memorizing words. The best part — Kids actually want to work on the program which always makes a curriculum a winner with parents. Have You Used This Foreign Language Curriculum?